100 E&MJ • JUNE 2018 www.e-mj.com PROCESSING SOLUTIONS COMPANY PROFILE-PAID ADVERTISEMENT crograms of RCS per cubic meter of air). Plants must protect workers if they have an amount of RCS dust above the PEL of 50 µg/m 3 , averaged over an 8-hour day. To control these levels, OSHA provides guidelines regarding methods of compli- ance, advising companies to: • Use engineering controls – These in- clude isolating dust in sealed chute systems and dust collectors, and/or using water-based atomized suppres- sion systems. • Provide respirators – Compliance can- not be achieved by respirators alone, but respirators must be provided for use in areas where engineering controls can- not adequately limit exposure. • Limit worker access to high-exposure ar- eas – Limit access to areas where work- ers could be exposed to dust concentra- tions above the PEL. • Develop a written exposure control plan – Have it available along with monitor- ing results. • Offer medical exams to highly exposed workers – Review the regulation for com- pliance details. PM10 can penetrate the body's natural defenses, such as mucus membranes, cilia, etc. 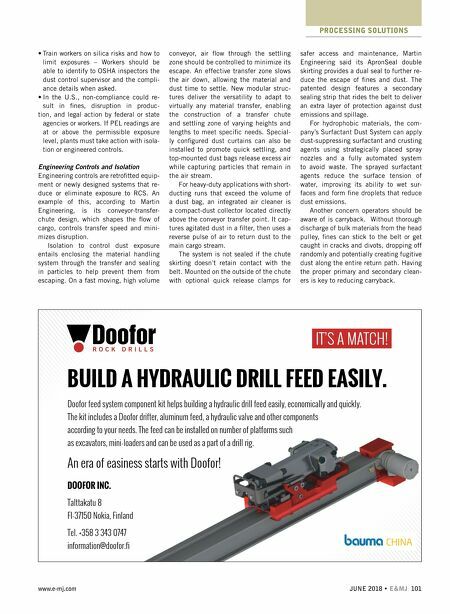 Doofor Inc. has manufactured hydraulic drift- ers since 1993, thus 2018 being its 25th year as a hydraulic drifter manufacturer. 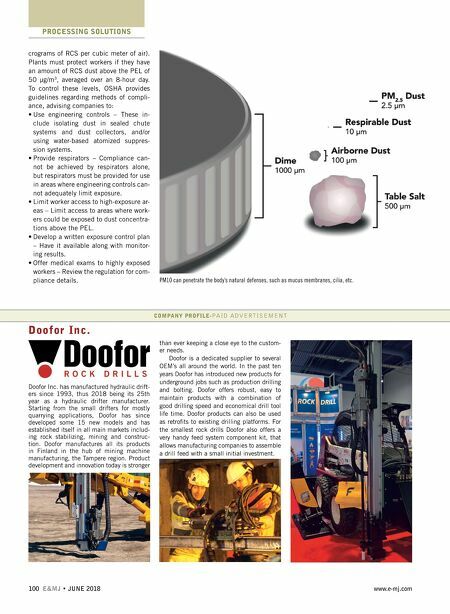 Starting from the small drifters for mostly quarrying applications, Doofor has since developed some 15 new models and has established itself in all main markets includ- ing rock stabilizing, mining and construc- tion. Doofor manufactures all its products in Finland in the hub of mining machine manufacturing, the Tampere region. Product development and innovation today is stronger than ever keeping a close eye to the custom- er needs. Doofor is a dedicated supplier to several OEM's all around the world. In the past ten years Doofor has introduced new products for underground jobs such as production drilling and bolting. Doofor offers robust, easy to maintain products with a combination of good drilling speed and economical drill tool life time. Doofor products can also be used as retrofits to existing drilling platforms. For the smallest rock drills Doofor also offers a very handy feed system component kit, that allows manufacturing companies to assemble a drill feed with a small initial investment. Doofor Inc.